Unlike UIScrollView on iOS, NSScrollView on Mac does not have a handy scrollEnabled property for you to set to NO if you need to temporarily disable scrolling in your app. If you Google around, you can find several posts on websites like stackoverflow that ask questions like How can I disable the vertical scrolling of a NSScrollView? Some have suggested setting the hasVerticalScroller property to NO as the answer. However, the hasVerticalScroller property only effects the visibility of the scroller, a value of NO does not actually prevent scrolling. There are also ways to constrain scrolling from an NSView subclass, as described in Apple’s documentation here. Constraining scrolling from a view subclass can be useful, but what if you want to just temporarily disable scrolling? This technique will work in most cases, but there may be times when a view inside of a scroll view implements autoscrolling behavior (perhaps if the view is a dragging destination). If you need to temporarily disable scrolling in such a case, you may want to subclass NSClipView and block scrolling from the appropriate methods there. It would probably be better if Apple just added a scrollingEnabled property on NSScrollView. I thought it would be fun to post quotes from various articles/blog posts I found around the web about the Objective-C programming language. Objective-C is still my primary programming language. I would like to believe that for Swift to win, Objective-C does not necessarily have to lose. I cannot help but wonder if many are discrediting the language because it is simply a trendy thing to do on the blogosphere. Has the tone changed? Alex Payne: I’m constantly surprised at the popularity and success of Objective-C. Almost everyone I know tells the same story about Objective-C: they started learning it and they hated it. They thought it was the worst of C and the worst of dynamic languages. And then eventually, they learned to love it. Most of the time, that software works pretty darn well, so who am I to judge? I’m pleasantly surprised by the continued success of Objective-C, and I think it should be taken as a lesson for the language designers out there. In the past few years, quietly, almost invisibly, Apple has transformed its Objective-C language into the best language available. I have been working with Objective-C since the release of the iPhone App Store in 2008. In that time Objective-C has evolved from a clunky, boilerplate-heavy language, into a tight, efficient joy. It is an amazing tool. Anything that I would not write in C I would want to write in Objective-C, were support available. The changes that made Objective-C this way are fairly recent. Basically, they were introduced in 2011, and weren’t supported by enough iOS devices until some time after that. Developers have been able to observe the new features only recently. So I am fairly certain that what I have to say is news. Obj-C is a beautiful and simple extension to plain vanilla C, giving you both the simplicity of C, and the power of C++. It is a major reason why the Apple toolbox is as good as it is, and the apps work as well as they do. Don’t underestimate that. Java looks more like an extension to xml, with its endless nesting. Where Obj-C teaches you good programming habits, java does the opposite. In even basic java templates, you will see methods with the same name. In my first project, made from Wenderlich’s tut, I never dropped below 200 warning. Two hundred. Inline overrides and methods might be good for quick fixes, but they will quickly turn your code into a bloated mess. There are no headers, to in a glance tell you what a class does, and you will in no time lose track of what you are doing. I could go on. but I’ve grown very fond of Objective-C. It’s just better and cleaner than Java. *Article Title: Android vs. iOS Development: Fight! Android vs. iOS Development: Fight! When the iPhone came out, the Objective C language became a hot topic. I was so excited about the thought of writing games for iPhone that I forced myself, despite wariness at [[funny foreign] syntax], to learn Objective C and begin writing a game. Boy was I surprised when I came to love Objective C’s simple elegance and powerful Foundation classes. Now, after nearly three years of making games in Objective C with Cocos2D-iPhone, I’ve discovered Cocos2D-X and unearthed a whole new love for C++. If Objective C is an automatic transmission car, then C++ is a manual. One might argue that the automatic car is superior because it’s easier. However, that one hasn’t had the experience of clutching into neutral across a gravelly patch to avoid spinning the tires. C++ has more speed and control, yet it requires a greater level of skill from the programmer. IS SWIFT EASIER TO LEARN? From a pure programming standpoint, you’re almost guaranteed to be more productive using Swift. Of course, if you’re an expert Objective-C developer, that might not be the case. 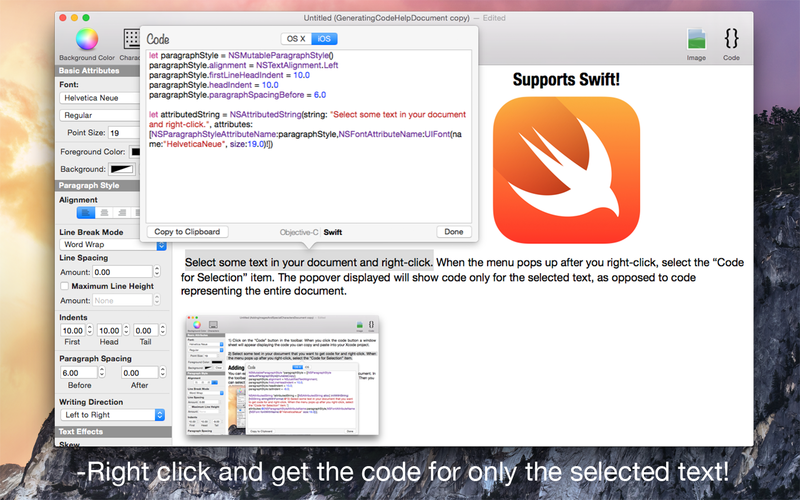 Swift is the obvious choice if you’re new to iOS and looking to get up to speed quickly. The language will stay out of your way allowing you to focus on the things that matter: making your app work the way you want it to! So which is it? Is Objective-C readable or too verbose? Is Objective-C complicated (like Latin?) or is it so easy that anyone can pick up a book and learn the basics? I personally did not find Swift any easier or harder than Objective-C when adding Swift support to Visual Attributed String. I wonder how much, if any, of the praise and criticism expressed in these quotes, has to do with influence from a very powerful, external force. 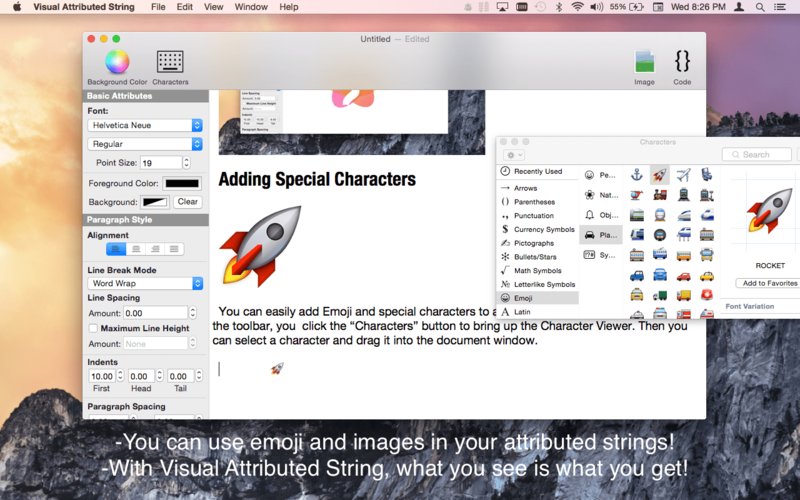 Visual Attributed String: An Essential Tool for iOS and Mac Developers Released on the Mac App Store! 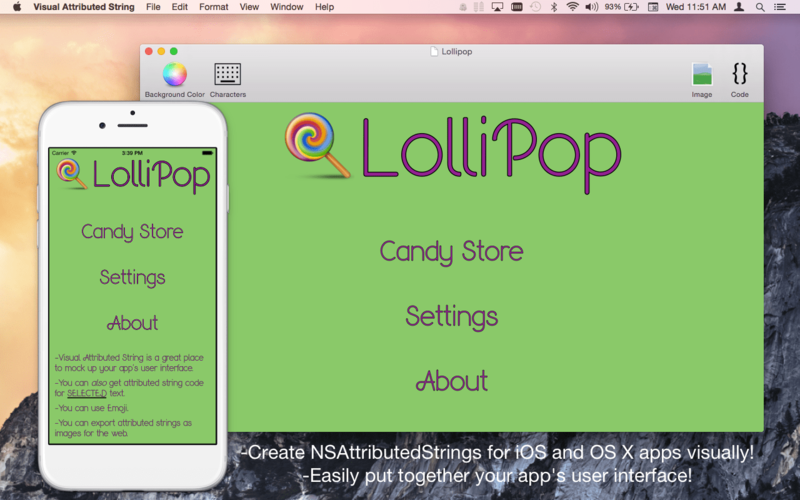 -Platform Specific Code: generate code to create NSAttributedStrings for both iOS and OS X. -Generates both Swift AND Objective-C code! -Get the code for your entire document by clicking “Code” in the toolbar! -Get the code for only selected portions of text by right-clicking and selecting the “Code for Selection” menu item! This allows you to get code for individual words/paragraphs as you need them on a long document with many different text styles! -Save your text as an image to use for the web! You can also generate images for only selected portions of text by right-clicking and selecting the “Image for Selection” menu item! Supported image formats include: .png, .bmp, .tiff, and .jpeg! -Smart Code Generation: Visual Attributed String is smart enough to generate code for non-mutable attributed strings (NSAttributedString) and mutable attributed strings (NSMutableAttributedString) based on your typed text! -Easily add emoji and special characters to your attributed strings by clicking the “Special Characters” toolbar item to bring up the characters palette! -Change the background of the entire document to see how your text looks against different background colors. If you want to get the code for your document’s background color, you can simply right click and select the “Background Color Code” menu item! -Add images to your attributed strings! 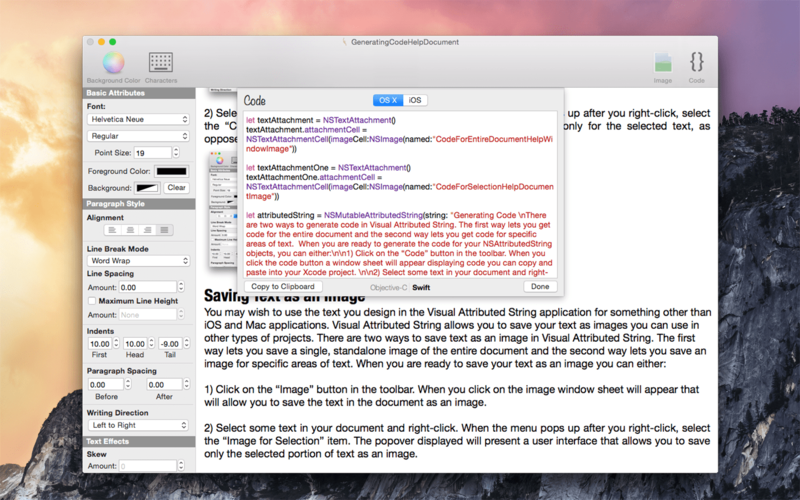 Just drag and drop an image from Finder onto the window to add images to the document! Did you know NSAttributedString is capable of displaying images? -Custom Font Warning: Visual Attributed String will warn you if your document uses a custom font that is not included in the iOS SDK! -Visual Attributed String is a document-based application and supports features such as autosaving, duplicating documents, renaming documents, and reverting document versions! 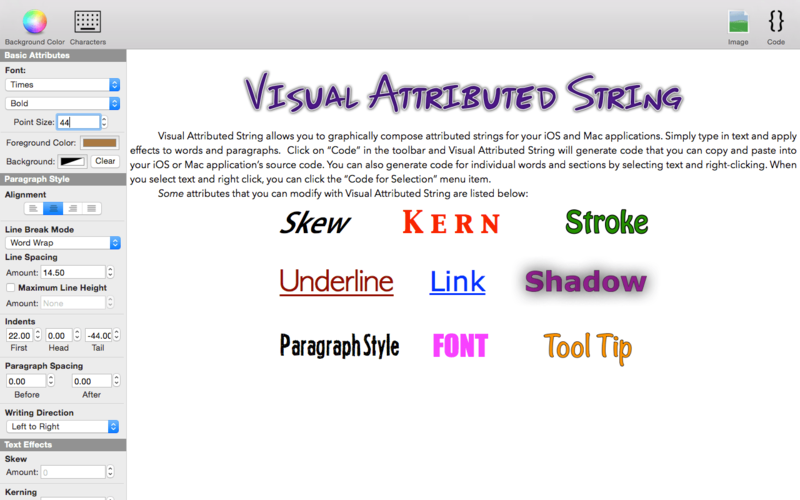 For more information on Visual Attributed String you can go to the Mac App Store or the official Visual Attributed String website. Now when you call myOldMethod in your code, the compiler will warn you that: “myOldMethod is deprecated. Use the myNewMethod instead”. You can also add the deprecated attribute to property declarations. But what if you wanted to be more specific? For instance, if there is a better way to handle something in the iOS 8 SDK, you can mark an old method as deprecated only for projects that have iOS 8.0 or later as the deployment target. Using the code snippet above, if you call myOldMethod the compiler will only warn you that the method is deprecated if your project’s deployment target is set to iOS 8 or later. Deprecating your own methods can come in handy especially if you have written your own framework that is used across multiple projects. You may choose to deprecate some of your own API rather than removing the methods entirely until you get around to adapting your existing projects to use your new API.